New Hampshire Mature Senior Drivers: Auto-Car insurance companies offer policy holders a safe driving discount for taking an online mature driver improvement or accident prevention course. In fact, insurance companies shall by law in many states to give drivers aged 55 and older an auto liability Insurance discount for completing this course. In some states, the discount is up to 10-15%! New Hampshire Mature Senior Driver Improvement Program Courses are available online for a car/auto insurance discounts where drivers can get up to 15% off (depending upon specific insurance company and policy terms) their existing and current insurance premiums. See your insurance agent/agency or insurance policy for details. These discounts are standard and common among most insurance companies. Drivers under the age of 55 can qualify for the insurance discount by simply signing up and taking the course. New Hampshire Mature Driver Car Insurance Discount & Refresher Program Course for Auto Insurance 3 Year Discount. This course can pay for itself on your next car insurance bill and over and over for 3 full years! The New Hampshire Mature Driver Car Insurance Discount Course provides a certificate of completion which allows you to fax or mail to your car insurance company for a discount of up to 15% off your existing premiums in many cases. 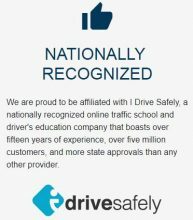 Email this page to a friend or ask your spouse to take this Mature Driver course online for a car insurance discount or an extra car/auto insurance policy discount.